EL CAJON (4-6-2019) – The list of top-notch, softball-playing sisters from East County is long. 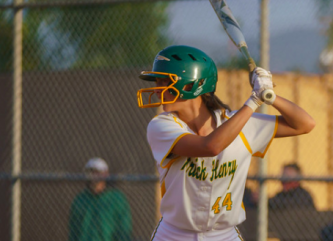 One of the latest is freshman shortstop Kaiah Altmeyer of Patrick Henry, who helped down Grossmont in Friday’s (Apr, 5) Battle for Cowles Mountain. Altmeyer slugged a 2-run double to cap a 4-run rally in the 4th inning, helping the Patriots secure a 7-2 decision over the “host” Foothillers. The contest was slated for Patrick Henry, but moved to Grossmont as the much-delayed reconstruction of the Pats’ diamond has extended into a second year. Altmeyer’s older sister, Sierra, shared the 2014 East County Player of the Year Award with Courtney Horne, of West Hills. She is currently a red-shirt senior at UC Santa Barbara following a knee injury. Meanwhile, Patrick Henry received big hits from several of its youngsters to key the comeback from an early 2-1 deficit. The main goal for this year’s edition of the Patriots is to re-join the list of elite ballclubs in the CIF-San Diego Section. This non-league game was decided by Patrick Henry by simply making more plays, be it with the bat or glove. Early on, Pats third baseman Lauren Nett snared a line drive off the bat of Grossmont’s Kati Contreras, turning a double play by firing the ball to first baseman Hailey Jenks. Altmeyer also ranged into the outfield to secure a blooper to rob Grossmont of a base hit. The bats then opened up in the 4th. After Sydney Newton reached second base on an error, she quickly scored on a game-tying double by freshman Savannah Sutton. Altmeyer followed by pulling a line single to right field for the go-ahead run. Two batters later with two runners in scoring position, Grossmont elected to pitch to sophomore Edie Guthrie instead of issuing an intentional walk. But the strategy back-fired when Guthrie drilled a liner drive to the outfield (the teams split on the ruling of either double or error), with two additional runs scoring. The other powerful underclassman for the Patriots is freshman Olivia Gigante, who smashed a 6th-inning homer to left field. It was her fifth homer of the season, moving to within one of the East County lead. Giganti then returned to the circle in the 7th to cap her complete-game pitching effort, throwing a 7-hitter with 7 strikeouts. The Foothillers runs came in the 2nd, as Jamie Medlin smacked a lead double to center field. Natalie Emery singled, with both runners advancing an extra base on a throw to third base. Contreras, the designated player, followed with a 2-run single to right for a 2-1 lead, overcoming an unearned run by the Patriots in the 1st. For 6th-ranked Patrick Henry (9-2), Giganti batted 1-for-2 with two walks and a pair of RBI, raising her slugging percentage to .828. Grossmont (11-6) continues a difficult schedule stretch. On Saturday, they travel to Pala in extreme North County for the semifinals (and possibly final) of the Jaguar Classic. Then on Monday, they travel to No. 3 Granite Hills. STEELE CANYON 7, VALHALLA 0: At Rancho San Diego, Cougars pitcher Grace Richter struck out seven batters in firing a 3-hit shutout at the visiting Norsemen in GHL action. Bianca Morales supported the offense by going 4-for-4, including a home run and a triple to collect a career-best five RBI. The Steele Canyon third baseman now had driven in nine runs in her last pair of outings. Perfect days at the plate were also registered by Audrey Bagge (3-for-3, with a double and a walk), J.J. Venzor (2-for-2, 2 walks), and even sophomore pinch hitter Carlie Williams (1-for-1, double) for Steele Canyon (8-8 overall, 2-2 GHL). Valhalla (6-14, 0-4 GHL) received base hits from Yanely Gonzalez, Delaney Stettler and Jade Hill. SANTANA 6, WEST HILLS 2: Sultans pitcher Madison Mendez ran her record to 6-2 after stopping their cross-town rivals with a 5-hitter. Mendez struck out seven and walked jus one. The triumph gave Santana (8-4 overall, 4-0 GHL) temporary custody of first place in the Grossmont Hills League at 4-0, a half-game better than idle Granite Hills. The Grossmont-Granite Hills game was graciously switched to Monday by the Foothillers so the Eagles could honor an invitation to participate in the high-profile Michele Carew Classic in Orange County. The Sultans jumped to a quick 3-0 lead. After the Wolf Pack answered with two runs in the 2nd, Santana tacked on three more in the 4th to coast to the win. Mendez was joined by teammates Joey Barkhimer and Ashley Madrigal in stroking doubles, part of an 11-hit attack. Mendez also collected two RBI, as did Ashley Madrigal (2-for-2, while Gilliane Johnston scored three times. West Hills (4-10, 0-4 GHL) received consecutive RBI at-bats by Emma Bentley (songle) and Mia Colabella (grounder to the right side). Meanwhile, some of the new faces include Kylie Mead (2 doubles, 2 RBI), Kiki Angeles (2-for-3, plus a walk), and Maddy Taylor (3-run triple). El Capitan (13-5 overall, 2-0 GVL), which has won nine of its last10, next hosts Helix on Wednesday to break the teams’ first-place deadlock. Monte Vista (8-6, 1-2 GBL) saw Abigail Johnston, who played at catcher and shortstop, bat 2-for-3 with a pair of doubles, one for an RBI. HELIX 10, EL CAJON VALLEY 0: At La Mesa, Highlanders pitcher Casey Castro came one batter shy of a perfect game, yet still registered a no-hitter of the visiting Braves. Castro finished with seven strikeouts. The Grossmont Valley League leading Scotties (10-7 overall, 3-0 GVL) tallied eight runs in the 1st inning, then called off the (Scottie) dogs before adding two in the 5th to invoke the run-rule. Kori Jonilonis recorded a 2-run single to highlight the offense, which was aided by 13 walks. Camryn Jonilonis, her sister, went 1-for-1 with a base on balls. The lone baserunner for ECVHS (0-8, 0-3 GVL) was sophomore Dulce Zarate, who was hit by a pitch with one out in the 4th. MISSION BAY 14, CHRISTIAN 8: At Dawson Field in El Cajon, Patriots shortstop Audrey Shebloski belted her fifth home run of the season, but the visiting Buccaneers were to much for Christian. Shebloski batted 3-for-3 were her homer and a double, scoring three times, raising her batting average to .538. Meanwhile, Mallory Steele added a 2-run triple. The contest was tied at 4-4 through one inning, then 8-8 after four frames before Mission Bay (8-4 overall) tallied six times in the 5th to capture this Western League opener. The Patriots fell to 2-10 overall.